First, have you entered for your chance at a $50 gift certificate from Minted? No?! Be sure to check out the previous post: Hello October for your chance to win. You can enter until Thursday night. And, if you aren't sure what Minted is, well, it's a pretty awesome online stationary company. They have the cutest holiday cards, stationary, business cards, plus more.... so fun. You can read more about them on the post I mentioned. Go enter! Ok, and now onto today. If you are following along with the Nativity tutorials I wanted to share a quick new thing. I recently sold a Nativity set to a super nice lady and in our back and forth conversation she had asked if the set came with a stable. At first I said no but after a bit I changed my mind and I a stable to include with her set. It turned out to be just the right addition. So, if you are making a set of your own, here's the difference. Cute, right?! I think it really does complete the set. Sadly, I didn't make a tutorial with step-by-step pictures but as an added bonus for those of you that are following along with the monthly tutorials, I'm going to explain how I did it. This is NOT our October tutorial, it's just something extra you can do if you'd like. Supplies: You will need tin foil and brown clay, I used Chocolate by Sculpey. Gold clay and wire. Step 1: Start by making the four main posts. To make them, I crumpled up tin foil for their centers and then wrapped the brown clay around them. be sure to flatten out the bottoms so they make a good foundation. I did make the two front pillars slightly taller than the back. Step 2: Crumple up and roll out 8 thin tinfoil "ropes", they should be about 5 inches long, then cover with clay. These will make your three supporting beams and also the top of your roof. You can see the three supporting beams in the photo but the top of the roof is hidden. Step 3: Line up your 5 roof pieces so they are laying parallel next to each other. Then add and attach, by pressing firmly, the three support beams. As you can see in the picture the two end support pieces are in from the end about a half of an inch - or, just far enough to make sure that part of the roof can attach to the support pillars. Make sure that you press your clay together firmly. Step 4: Attach your roof to your four support pillars. Step 5: roll out three thinner clay ropes, not too thin though, and attach these mid-way up on your support pillars. Make sure they are attached well. That's it for the stable for now, set aside. Step 6: Using your gold clay, shape a star. I hand shaped mine but there are clay cutter you can buy that are in the shape of stars. After it is shaped, cut off a piece of wire about 4 inches long and insert one end of it into the base of the star - you must do this before cooking the clay! Step 7: Next, cook your clay in a preheated 275 degree oven for about 18 minutes. Step 8: Once your items are cooled, attach the star to the roof by wrapping the remaining wire around the center support beam on your roof. 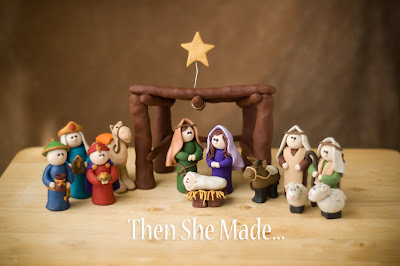 And, there you have it, you are now done and have a cute little stable to add to your nativity. Only three more pieces to go and we'll have our full set! I am absolutely amazed by your nativity scene. Both with how incredible it looks and how simple your instructions are. I do believe I might actually be able to give this a go!!! You have a great way of explaining how to make each item and the photo's are awesome. On that note, I have gone through each figure and worked out what colours I need etc to make the whole set but was wondering... How much clay do you need? I wasn't sure if a 25 gram block would be okay for most or if I need more (have never worked with clay so have no idea how far it goes). Many thanks. Melanie (Christchurch New Zealand). by any chance, do you sell nativity like the one pictured? you can email me at "dolphlynn71@gmail.com" with your prices...thanks!